Pyretic Productions and Punctuate! Theatre’s most recent show, Blood of our Soil, packs a punch. Onstage in the Tarragon Theatre Extra Space, playwright and star Lianna Makuch brings the audience into her world and personal/familial tribulations. I have become a little wary of all-about-me one-actor shows. Everyone has interesting and fraught personal stories, and it can seem a little closed-minded or creatively hampered to base a work on only oneself. However, Makuch blasts through that fear: while her story is personal, it is also the story of more than a million Canadians. I grew up in Bloor West Village, in one of the delightful pockets of Ukranian residents. Other than the delicious pastries, pierogis, and “socks-with-sandals” street festival, as I used to call it as a child, what struck me most about Ukranian culture then was the energy of the music, and the beauty of the traditional clothing. 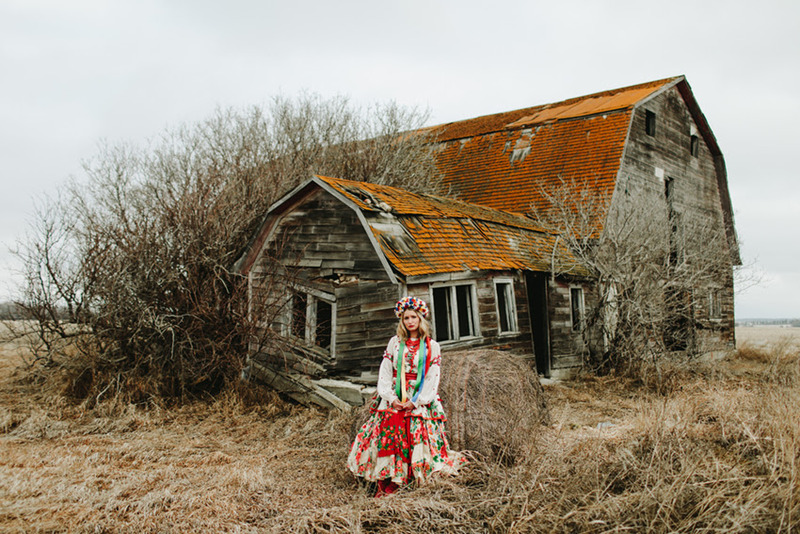 Makuch uses subtle costuming and reference to traditional clothes to convey a difference in timelines, bouncing between modern-day and WWII-Ukraine. Her passion and creativity shine throughout the whole show. It is no wonder, too, that Larissa Pohoreski, music director and actor, was nominated for Best Original Score for Blood of our Soil. The music pulls the show together in a way that engages all actors and audience alike. What a trip back through my childhood, and how wonderful the presence of instruments onstage was. The music weaves through the play so intimately, that it is clear the play would not succeed without it. I was also struck so personally by the story of war. An interesting exhibit in the lobby of the theatre sheds further light on the conflict in Ukraine, an exposition for those who do not know, and a sad reminder of the terrors for those who remember. It is always so shocking to be confronted with the fact that ‘war’ is not something of the past. It affected our grandparents, parents, and still affects us today. As a child of an immigrant family who fled to Canada to escape war and corrupt government, I can relate to the story and pain that Makuch reveals throughout the evening. Touching on inter-generational and cultural trauma, Blood of our Soil teaches us lessons of how to love, and how to remember. Makuch also references survivor guilt, in how the far-flung characters in her family tale are able to (or are hampered by) the drive to communicate across such different worlds. This play does fall prey at time to over-acting from the chorus, where the enthusiasm of the actor surpasses what the character means, jolting the audience back to reality and breaking the magic of the stage. I am left watching a person on a stage, instead of a character in war-torn Ukraine. Despite some of the hiccups, Blood of our Soil is incredibly touching and effective. Moments of humour are scattered throughout, breaking the tension as is much needed. I found myself weeping as we moved into intermission, and was driven to find feelings of love, family, and history around me. I thank Lianna Makuch and the whole team for the evening that was both so difficult, and so wonderful.